Downton Abbey actress Elizabeth McGovern has revealed she wants to form a band featuring members of the hit costume drama's cast. McGovern, who plays Lady Cora in the ITV series, moonlights as a singer in her own band Sadie and the Hotheads, who have run of gigs lined up at London's Hippodrome Casino this November (2013). In the past, McGovern and her band have been joined on stage by Michelle Dockery, who plays her on-screen daughter Lady Mary and is also a trained jazz singer and talented guitarist. Several other Downton Abbey stars apparently have experience playing in bands too, including Allen Leech, who appears as McGovern's on-screen son-in-law Tom Branson. Now McGovern has hit upon the idea of bringing them together for charity performances. "We happen to have a lot of musicians in the cast but as yet we've never formalised anything," she told the Mail On Sunday. "It would be interesting and definitely very different, I wouldn't know which way we'd go musically, but it's a fun idea." McGovern did not say whether Maggie Smith, the show's scene-stealing Dowager Countess, would be likely to join the line-up. Meanwhile, the new series of Downton Abbey begins this Sunday (September 22) at 9pm on ITV. 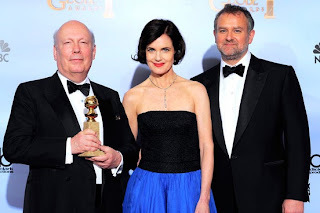 Created and written by Julian Fellowes (pictured above right with Hugh Bonneville and McGovern), Downton Abbey debuted on ITV in 2010 and has gone on to become a major international smash. Over 120 million viewers worldwide are now estimated to have watched the show and Mick Jagger has recently declared himself a fan.